The national employment data for March released a few weeks ago — only 120,000 net new jobs — was, by all accounts, disappointing. The Kansas City area saw a similar lackluster performance. Area employment remained virtually unchanged, while the labor force dropped slightly, leading to a very small drop in the unemployment rate. As mentioned before in this newsletter, the region needs to see sustained growth in both the labor force and employment. When the growth in employment steadily outpaces the growth in labor force, there will be a drop in the unemployment rate we can actually feel good about — instead of the glimpses of positive news seen so far in this recovery. Help-wanted ads continue to be strong, but it is somewhat puzzling that this apparent increase in employer demand has not yet translated into growing employment numbers. This may be due to job churn — that is, advertising to fill existing jobs where there is high turnover. One position could be advertised multiple times in a year if the turnover is high. 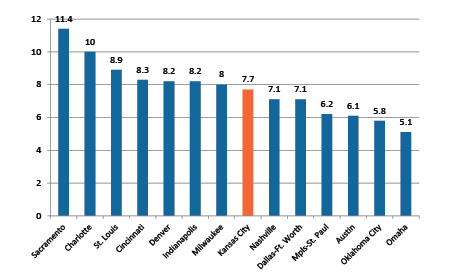 Kansas City still remains in the middle of the pack compared to selected peer metros based on February’s unemployment rate. High growth metros like Austin and Dallas continue to have lower unemployment rates, as do metros that did not feel the recession as badly, such as Omaha and Oklahoma City. [Definition: Total persons age 16 and over who worked for pay.] Employment remained steady from February to March and is up only slightly from one year ago. Labor force numbers have been stubborn so far in 2012. 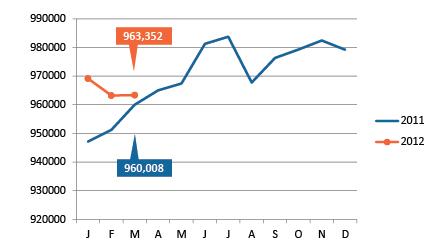 Our March figure is down by 6,600 from one year ago. [Definition: The number of unemployed as a percent of the total labor force.] 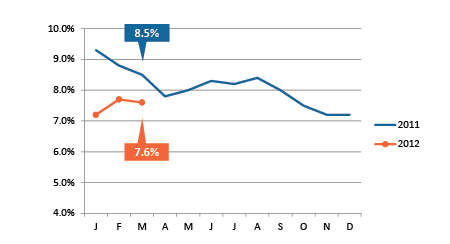 The unemployment rate dropped by one-tenth of a percent in March, to 7.6 percent. This is nearly a full percentage point lower than it was last March. 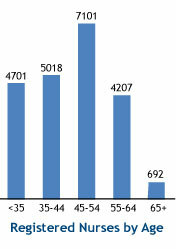 March saw 18,468 new help wanted ads posted in the Kansas City area, up almost 4,000 from one year ago. 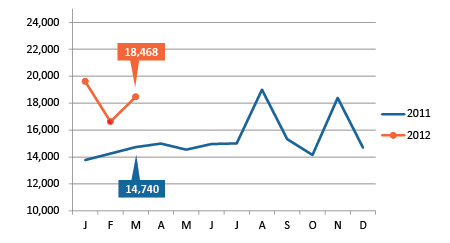 Of the 18,468 new job postings in the Kansas City metro in March, 1,187 were for registered nurses. There has been a steady rise in job posting for registered nurses since early 2009. And demand is likely to grow — more than half of those currently employed as registered nurses today are over the age of 45, and almost 20 percent are over the age of 55, not far from retirement age. If we were able to permanently fill 500 of the March job postings for registered nurses right now, the work performed by these new hires over the next few years would stimulate the creation of an additional 400 area jobs elsewhere in the Kansas City economy and boost its gross regional product by $93 million.